It took a while, but we’ve finally analyzed the computer data from a game last summer, and what we found was pretty striking. Remember that we only brought along a laptop with a small peripheral, which was generating a string of random numbers – it was like flipping a coin 1000 times per second, and you'd expect them to come out 50% heads, 50% tails, more or less. Researchers at Princeton have found that the output from a random number generator (RNG) becomes less random – more coherent – when a lot of people are focusing their attention on the same thing at the same time. In other words, the human mind can affect a machine - a finding that they replicated hundreds of times. How it actually works, no one knows, since there’s no microphone or electrode in the setup. But it does happen. Be that as it may, we partnered with researcher Scott Wilber, whose Psigenics RNG processor is a state of the art advance over the Princeton software (www.psigenics.com has plenty of details). Here’s the tracing his device generated for the last two hours of the game played on July 13, 2007. There were 7 moments when coherence was particularly high, when the reading was outside of the gray zone, more than 2 units (Standard Deviations, or SD) from the baseline of 50/50 randomness (or zero SD). As you look at the graph, keep in mind that it doesn’t matter whether the graph is going above or below the baseline; what matters is how far in either direction it diverges. Amazingly enough, all but one peak of coherence came at a crucial moment in the game; the odds against this happening randomly are more than 5000-to-1! 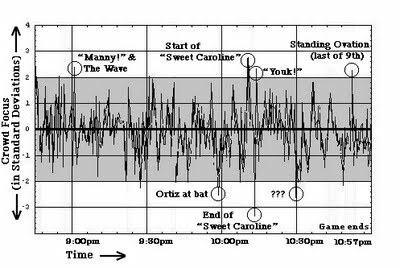 It’s a little confusing, but once you get the hang of reading the graph, you can see that highly emotional events were occuring whenever the RNG machine registered big deflections: The Wave: Big Papi at the bat: a hearty "Youk!" cheer: the last of the 9th: and most strikingly, the daily "Sweet Caroline" singalong. Somehow or other, the focused attention of the 35,000 fans in attendence caused the machine to respond. It’s hard to know exactly what it all means, because there are so many unanswered questions - what emotions matter, why did one peak happen when nothing was going on during the game, why did group singing have such a powerful effect, etc. We hope that we can test out the setup at more games next year. But at the very least, we’ve got some proof that there is an invisible force at work in Fenway Park. Pretty cool!